By their very nature, organizational change initiatives tend to occur while everyone is also busy keeping the business running. Often, change agents themselves are responsible for other important activities while also implementing their initiatives. It’s hard enough to get other people to make time for working on the change initiative, but what if you are having a hard time squeezing it in yourself? It’s easy to spot when change is starting to slip through the cracks. You put off project-related tasks until tomorrow or next week. Team meetings go unscheduled, waiting until things aren’t so busy. You do the bare minimum, leaving people without sufficient information or involvement so they start tuning out. Some people wonder if the project is still happening at all. You already know that if you aren’t driving the project forward, then chances are no one else will. If you don’t make it a priority and make time for it yourself, how can you expect anyone else to? If you find yourself too busy for your own initiative, here are some tips for making progress on your change initiative while keeping the rest of your job afloat. Rededicate yourself to the vision. In a state of overwhelm, it can be easy to lose sight of the goal and thus lose the drive to keep moving toward it. Take some time to inspire yourself again to make a difference. Refill your energy tank with purpose. Break it into smaller pieces. Trying to jam a huge project into an already overloaded schedule is daunting and can result in not doing anything at all. Set short-term goals with reasonable deadlines and break the project into smaller tasks. While still keeping an eye on the big picture, focus on the immediate next step you can take to move the organization closer. Create a routine. Work schedules tend to revolve around meetings, so schedule a recurring meeting, even if it’s just by yourself, to work on your change initiative. Set aside the same time daily or weekly to focus on what you need to do. Protect this focus time fiercely from distractions, until it becomes a habit you can’t break. Find an accountability partner. Change agents are often self-starters who work with a lot of autonomy. The trouble is, when you try to hold yourself accountable for results that you determine, it can be easy to let yourself off the hook. Instead, find another person who can help you stay accountable. They can ask about your progress and help you keep the promises you make to yourself. Delegate. 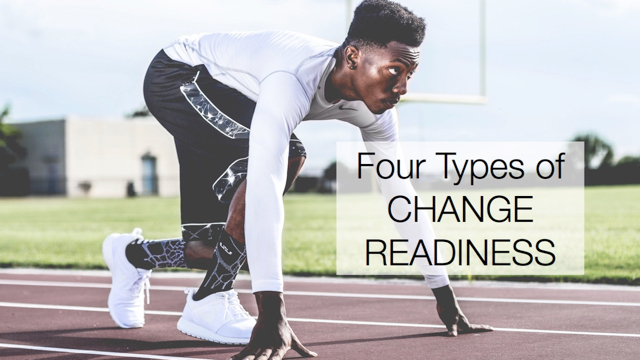 When your plate is full and you are implementing change, there are two things you can delegate: the regular job-related tasks that fill your time, or parts of the change itself. Delegating parts of your job gives you more time to dedicate to the change, while delegating parts of the change gets more people involved and can develop strong advocates. Check your own resistance. If you continue to put off the work of change by filling your time with other work or distractions, consider that lack of time may not be the only reason for your avoidance. Take an honest look in the mirror. What else may account for putting off the things you need to do to take care of your project: confidence, skills, fear, overwhelm, uncertainty? Perhaps you have plenty of time to dedicate to your initiative but everyone else in the organization has crowded it out. Good news: the same activities apply! Work through this list with others to help them find the time to focus on the change. As a change agent, you must model what it means to take the change seriously, and not let it slip through the cracks in your own schedule. Only then can you help others do the same.